Many ecological process can be modelled by simple systems of equations. An early example of this is the predator-prey model, developed independently by American mathematician Alfred Lotka (1880–1949) and Italian Vito Volterra (1860-1940). These are the Lotka-Volterra equations. Of their nature, and are positive quantities. We also assume that all the parameters are positive. Parameters and are the reproduction rates. If only rabbits are present ( ) their exponential growth is determined by . If there are only foxes ( ), they die out at a rate determined by , as there is no food available to them. When both species are present, and determine the interaction between them. The equation for the prey says that the change in population is determined by the growth rate minus the predation rate . For the predators, the second equation says that their population is determined by the food supply minus their natural death rate . In Fig. 1 we plot the velocity in the phase-plane for the case . Fig. 1. 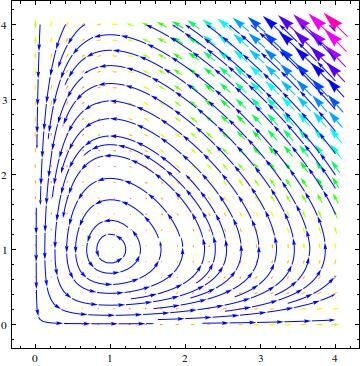 Velocity field for the Lotka-Volterra equations with k=1. Prey on X-axis and predators on Y-axis. Fig. 2 shows the contours of for three values of the parameter . It is clear that both and vary periodically, but out of phase. The phase-point traces out a contour in an anti-clockwise direction, with lagging about a quarter-cycle behind . First, the rabbits increase in number. The extra food allows fox numbers to grow. But as predation increases, rabbit numbers fall leading to reduced food for the foxes, which decline in numbers. Fig. 2. Contours of Z=Const. 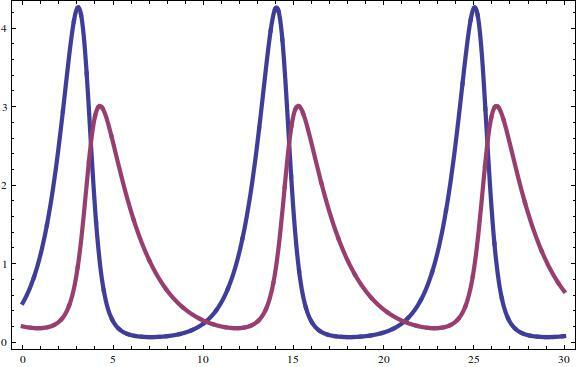 Left: k=0.1, Middle: k=1.0. Right: k=10. The cycle repeats indefinitely: Fig. 3 shows the solution for and for 30 time units with and . Fig. 3. Solution for X(Blue) and Y(Red) for 30 time units.